Note: please accept our sincere apologies for your September reading coming out in the latter half of the month. We have been kittening around the world with no fixed location working on our perspective visa issues (Chloe: Spain, Nicole: Thailand). Despite having made notes and pulled cards in a timely fashion, we simply couldn’t get the post done! So, today, in time for the full Aries moon of the month, we hope that you can use the wisdom of the Universe to reflect on how your September has been, and use the advice for moving forward. Thanks, as always, for reading. Your message from the Universe for September 2018 is crystal clear: instead of carrying the burdens your life situation has given you, open yourself up to the help, advice, skills and wisdom of others. 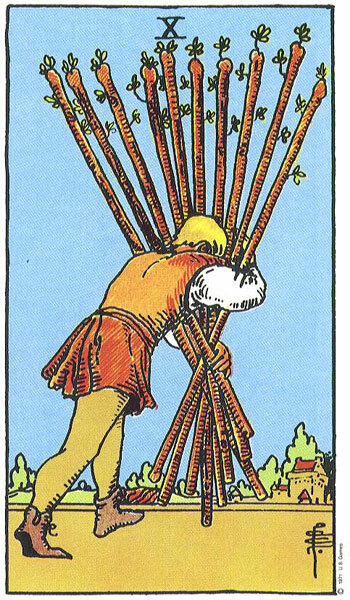 The Ten of Wands is a comically “bad” card that no one likes to pull. On it we see a man plowing forward carrying ten wands in front of him in the most inconvenient way he can, blocking off his view of the way forward. While life often hands us more than our fair share of hardships, the choice remains ours as to how we carry it in our minds. This is why pulling this card often comes with a chuckle or a frown: we don’t like to admit when we’re making a bigger deal out what is often quite a big mess. When we’re told that “it could be worse,” or, “you always have the choice to be happy,” those comments sting our egos and we want to shout, “You have no idea what I’m going through. You don’t know how unfair and awful it is!” and further plant yourself in the stalemate. But, knowing that we ultimately want to move forward, how do we most easily get out of it? Paired with the Three of Pentacles, the Universe urges you to go outside of yourself to lighten the load (or at least shift it to a position that’s easier to carry). This card is one of three in the deck that represent “the group.” In this case, a three person team who have come together for the joint cause of working on a large project. You’ve got the enthusiastic young person, who doesn’t necessarily know everything, but has a fresh perspective and can give you grains of truth within all their flurry of excitement. They’re like your cheerleader, hype lady, person who you can count on to dole out motivational quotes and lift you up when you turn to them in your darkest moments. The older, wiser person who perhaps comes from a religious or highly educated perspective and has a moral compass that you know to be upstanding. Someone you know follows a straight path and you can talk to about the philosophical side of things, to help gain a broader perspective of what’s going on. The last person is the one who’s done it before. They don’t necessarily know the most innovative way, or the most environmentally sustainable way, or the most righteous way, but they’ve done it before. This is the person who lets you know it’s possible, and you will get through it too. 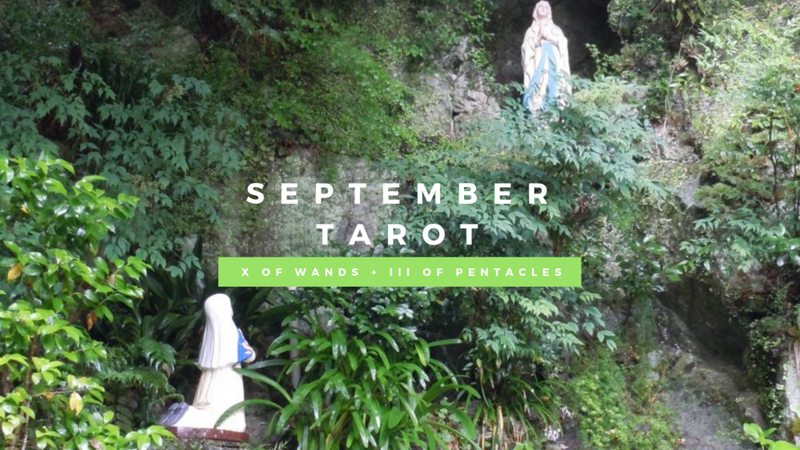 This month when you’re carrying all sorts of unnecessary burdens, or just one in particular, you need to reach out and expand yourself beyond to the “group” to gain a wider perspective to learn how to shift the wands to an easier and more reasonable position on your shoulder.